Home Resources ICIS Market Outlook: European benzene market at EPCA 2016 – how will 2017 look? 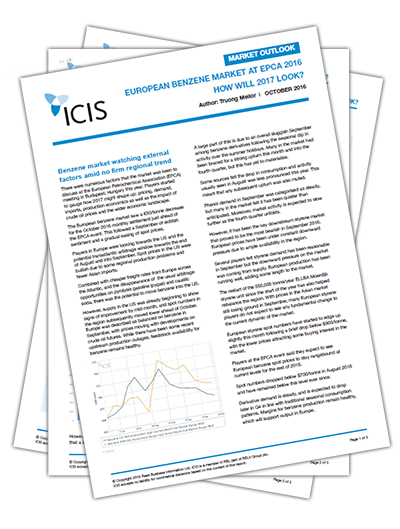 ICIS Market Outlook: European benzene market at EPCA 2016 – how will 2017 look? With benzene prices steady at the start of Q4 2016, European players at the 50th European Petrochemical Association (EPCA) meeting in Budapest, Hungary this year were anxious to discuss the various factors that will drive the market in 2017. The global market is poised to see a shift in dynamics with increased export volumes moving between regions. This will have further impact on liquidity in Europe, which has been struggling for several years due to the wider economic volatility and changing regional demand patterns.